The word meaning of Diaspora is scattering and is used to denote those people who have migrated from their native and moved to other places for work. Indian Diaspora is used to indicate those people who migrate to other countries for work or business. The Non Resident Indians and Persons of Indian Origins are the people who come under this category. It is estimated that there are around 30 million Indian Diasporas. The Indian Diaspora is of great benefit to the Indian government as they have helped in the development of our country economically and financially. The Indian Diaspora constitutes the unique force in the World culture. The Indian government has proposed several schemes and incentives for the benefit of the Indian Diasporas. Measures are taken by the government to link such people with their native land. The Indian Diaspora is spread to over 110 countries and the characteristics of this group also vary. The countries can be classified as Old Diaspora and New Diaspora countries. The countries that come under the category Old Diaspora include Malaysia, Mauritius, Trinidad and Tobago, Fiji, Guyana, and Suriname. The countries under New Diaspora are the developed countries like USA, UK, Canada, Australia and New Zealand. Besides these two classifications, a large number of Indians live in the Gulf countries. The people in gulf countries are mostly from Kerala state. 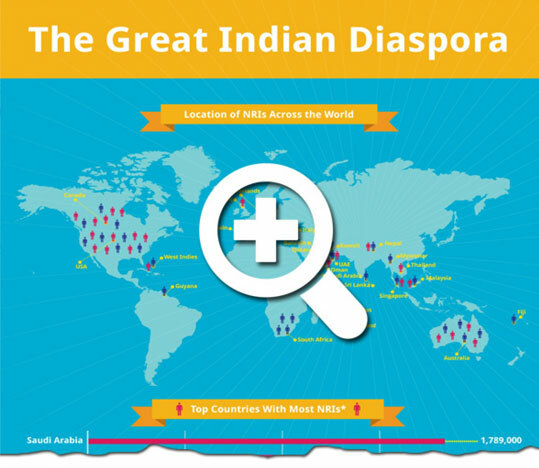 There is a Diaspora Services Division of the Ministry that deals with all subjects related to Overseas Indians which includes the NRI’s and PIO’s. Their matters are not specifically allotted to any other Departments of the Indian Government.